BINGHAMTON, New York (WTVD) -- Several college students in New York will miss Taco Tuesday this week thanks to a couple of pranksters. Where's the beef for Taco Tuesday? Well, it's in the...toilet? 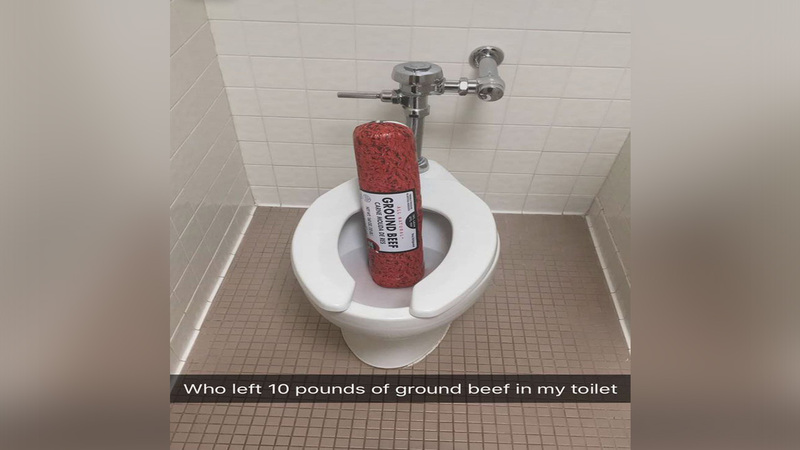 Binghamton University sophomore Jake Muller said he couldn't believe his eyes when he found 15 pounds of fully wrapped ground beef in his toilet. Muller said he went out to dinner with his friends and came back to find the meat inside of his suite's bathroom. While he and his friends were puzzled as to who could have played the prank, he did confess to leaving his dorm room door unlocked, giving the hamburglars free access to his bathroom. Around 10 p.m., Muller said he received an email from the resident advisor alerting students that the beef was missing from the kitchen's refrigerator. "That specific item, was meant for your upcoming community builder this Tuesday where the RA's were going to host a "Taco Tuesday" event for you all," the email read. "However, after this incident we are highly considering the continuation of conducting events like this where we strive to cultivate and foster a sociable atmosphere within our building." Muller said he immediately responded, telling the RA that the beef had been located. Alas, the meat was thrown out and the sophomore tweeted about the bizarre event saying, "So this happened today." But there's one thing we can't stop thinking about? Will the hamburglars strike again and why did they waste all that delicious beef?